If you are the proud owner of the Samsung Galaxy S Blaze 4G, and have been patiently waiting for T-Mobile to deliver the Android Ice Cream Sandwich update to your smartphone, your wait has just about come to an end, because the ICS update for the Galaxy S Blaze 4G will become available as of tomorrow. 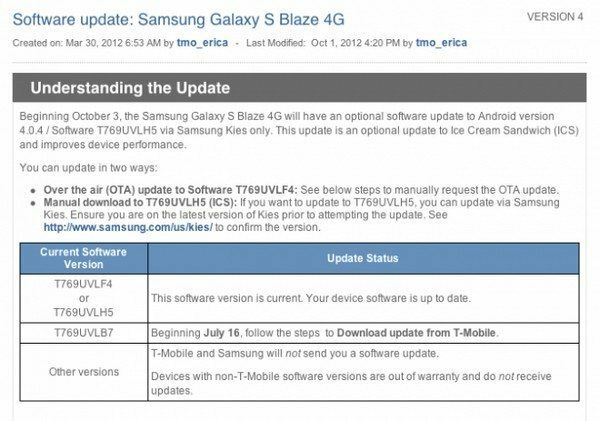 According to a report over on Tmonews, T-Mobile support has officially announced that the Android Ice Cream Sandwich update for the Samsung Galaxy S Blaze 4G will be available to download to your handset as of the 3rd of October, and is the T769UVLF4 ICS update. The Android Ice Cream Sandwich update for the Samsung Galaxy S Blaze 4G will be available over the air or you can of course manually download and install the T769UVLF5 ICS update via Samsung Kies. Although not Android Jelly Bean, the Android Ice Cream sandwich is still a major upgrade over Android 2.3 Gingerbread the Samsung Galaxy S Blaze 4G is currently running, and delivers all the expected goodness of Android 4.0 along with bug fixes, an email option fix and a mobile hotspot icon location fix. So there you have it, if you do own the Galaxy S Blaze 4G keep your eyes open for that over the air update notification sometime tomorrow, or if you get too impatient and simply can’t wait, fire up Samsung Kies to see if the update is available to download, and once you have updated, feel free to let us know how it all went and if you experienced any problem or not. I’ve been trying to obtain the update throughout the day and could not obtain it OTA or Kies Air. What’s going on?